display at these special Los Angeles showcases. More than 85 years of movie-making in Hollywood has produced many glorious memories and also (as you might expect) a lot of great movie memorabilia. There is no one grand Hollywood Museum to showcase these treasures, but there are quite a few smaller exhibition galleries showcasing everything from popular movie sets to spectacular costumes... from the cars the stars drove to the lingerie they wore. Would you like to to sit at the original bar from "Cheers"? Want to see the original Maltese Falcon? How about Hannibal Lecter's prison cell from "Silence of the Lambs"? It's all here in L.A., and much more. There's something for everyone, if you just know where to look. 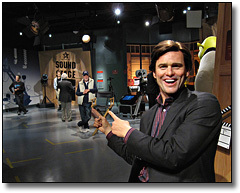 Below is a guide of all of the local museums offering an insight into Hollywood and its history.